Cycling enthusiast that he’s become, Ritchie trained for months for his Bike to the Beach. 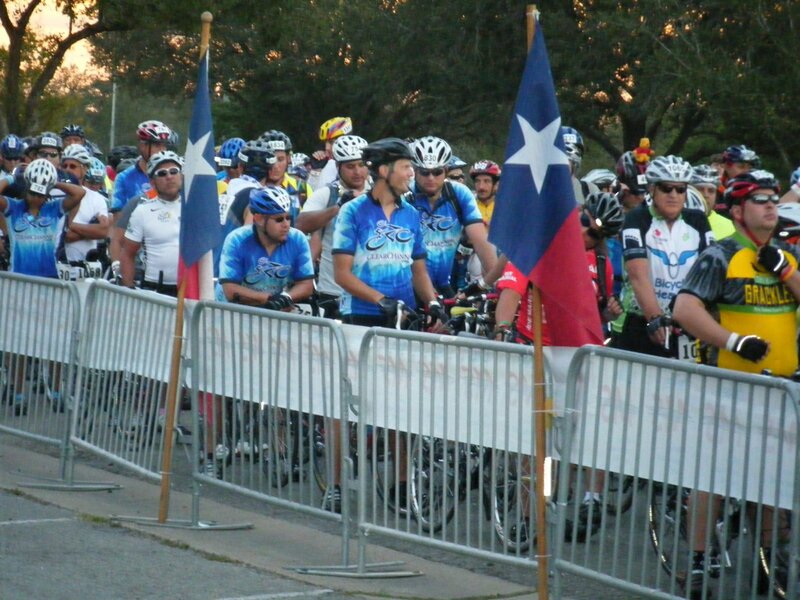 It’s an annual 2-day bike ride from here to Corpus Christi totaling 150ish miles. 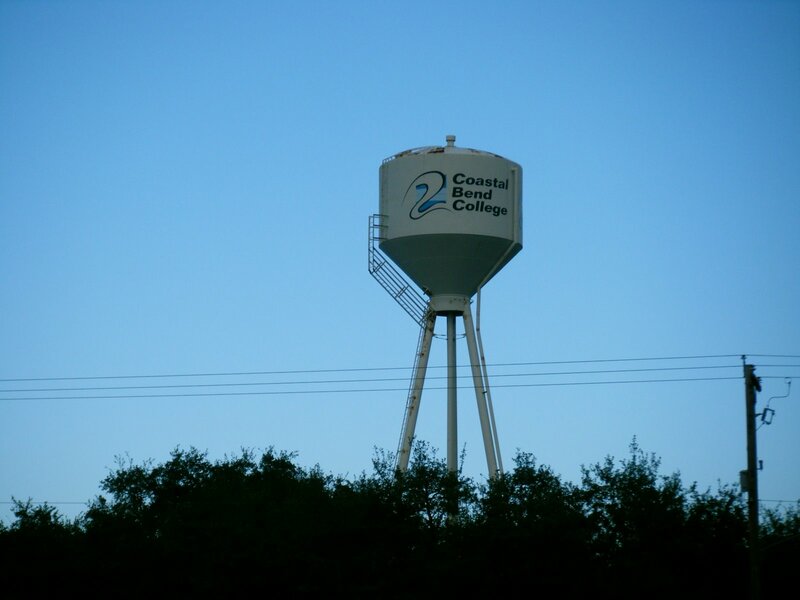 He started bright and early Saturday morning and rode on the highway shoulder from the AT&T Center to this college in Beeville, TX. I was surprised at how big the campus was for a little town. 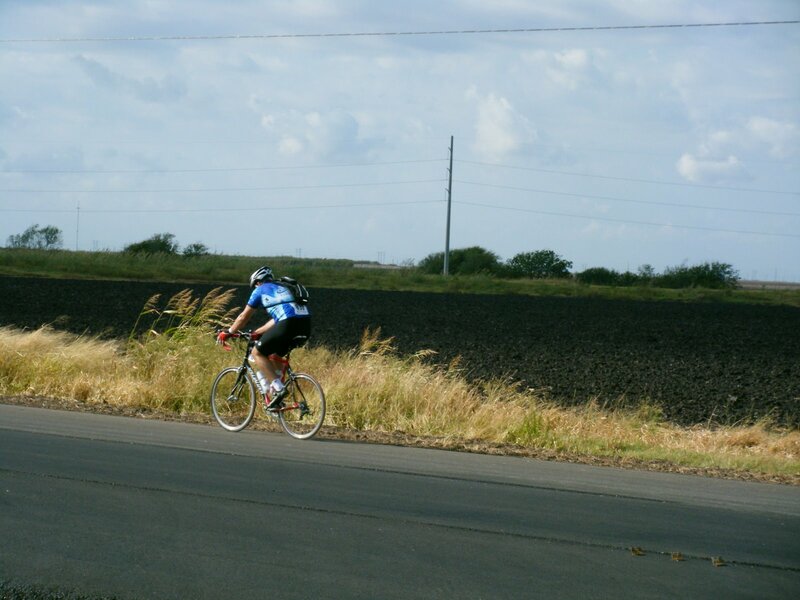 I just missed seeing him finish the first leg of the ride so I had him stand under the sign instead. Everything was very well-orchestrated. 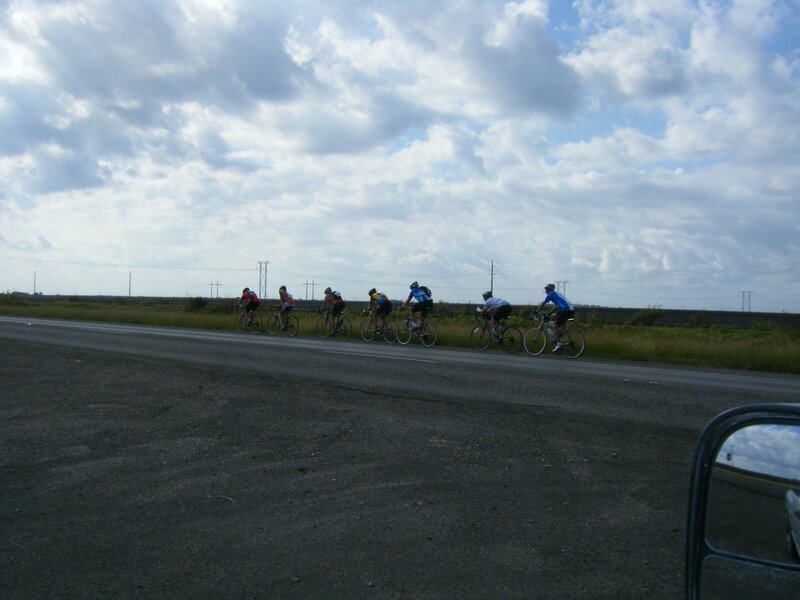 The gyms were open for riders to set up sleeping bags on the floor. The locker rooms were open for showers and bathroom use. The cafeteria was open the next morning for breakfast. We actually just camped out in the back of our truck overnight. It was pretty fun but next time we’re going to try foam mats. It was kinda tough to wedge our two air mattresses in between the wheel wells. We were both pretty tired so after a few rounds of farkle we hit the hay. 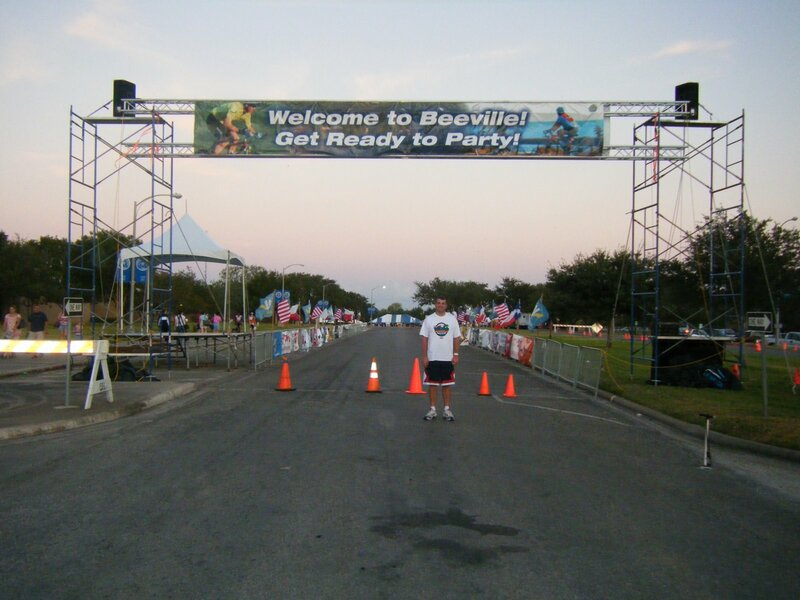 Ritchie bid farewell to Beeville the next morning at 7:30 with a bizillion other people. WOO HOO!!!! that is SO awesome!!! i have to go to class, but i’ll read your other post later. Way to go, REEEEEETAAAARRRDD!!! Way to go Ritchie! That’s so great! Steven will probably drool when he reads this, you guys will have to do one together…to bad he’s a pansy (if you read this Steven, I love you 🙂 and couldn’t take the cold while you were here. 🙂 That’s awesome though! I’m glad you got your chub-a-lub-lub in gear!!! Great job Richard! 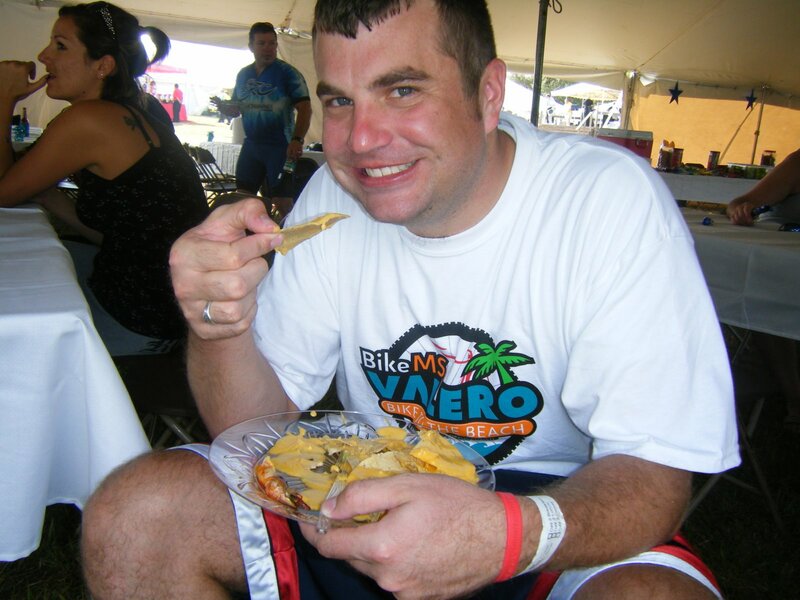 I love the video clip at the end…and the picture of him eating nachos, I am so jealous. Way to go Ritchie!! If we were there we would have been Whoo Hooing with Lindsay!! Good job! 150 miles??!! I am so impressed! I don’t even like to drive 150 miles. You’re an inspiration to us all! way to go ritchie!!!! Id been wondering about that bike ride since you told me about it! Well done!